I’ve got a small lump on my thigh. Not painful at all. Probably harmless, the GP said, but he wrote me a referral to get it removed. He asked if I private health insurance. Nope. I gave it up several years ago. It cost me thousands each year (and increasing) and rarely paid out anything at all. I had a previous lump in my chest removed at Cabrini, when I did have insurance. It was very good — they examined it and took it out on the spot. How much would that cost if I paid it myself? Heaps, the GP said, perhaps $1500 or more. Yikes. Public would be free, but he said getting it done would take ages in the queue. Ah well. The referral went off, and a letter arrived — appointment at Monash Medical Centre Moorabbin, which isn’t in Moorabbin, nor in City of Monash, but is a medical centre. The wait had only been a couple of weeks. I went in thinking hey, they might chop it out same day. Take that, private insurance! BEHOLD, THE POWER OF UNIVERSAL HEALTHCARE! The specialist took a look, agreed it was probably harmless (probably a lump of skin growth, rather than the fatty blob the last one was) and said I’d go on a waiting list to get it out. The waiting list would take a year to get through. Whatdaya know, my GP knew what he was talking about. Knowing that many specialists do both public and private work, I asked the specialist how long it’d take and roughly how much it’d cost if I paid myself to have it done privately. ‘Cos I’m in no particular rush, but it’d be nice to get it done and dusted. And this is a variation on self-insuring… not giving the insurance companies their profits, but being willing to spend money on your health where it’s beneficial. At this stage in my life, I’m well ahead doing that. He said it’d cost $150-200, in about 4 weeks. Wow, that’s great, I’ll be in that. Sold! Good on you. I couldn’t get my wife to ask financial questions to a medico so we are stuck. We have private health insurance because our assessable income means we would pay more in tax penalty than the annual insurance premium. Given your earlier blog that you earn too much for family payments, I’m surprised you’re not in the same boat as us. Good work :) That was cheaper than my biopsy that I got a referral too. My bioposy was about $450. Still cheaper than health insurance though. You wouldn’t mind paying private health insurance so much, if you weren’t left so much out of pocket after treatment. Health insurance is a scam. It’s not really insurance at all. You insure your car again accidents. You don’t get insurance to pay for your petrol, or your next set of tyres. If any insurance company tried to introduce a scheme for insurance for tyres, they’d be knocked over in the rush by people trying to pull some kind of scam. 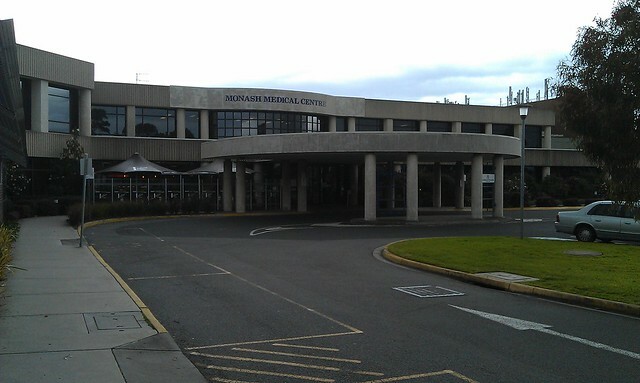 Did you notice the cost of parking at Monash Moorabbin Medical MCentre? I can’t believe how expensive it is! I had to go for a blood test (yes, I had to go specifically there) the other week and refused to pay for parking. Went back three times before I found a spot in the side street because they charge more than a wounded bull for the onsite parking there! How do they get away with it though? Hey, Jen. I can’t believe you are complaining about parking on Daniel’s blog site !! Get it out, or at least biopsied. Without wanting to alarm you, the last person I knew who had a probably-harmless non-painful lump on his thigh was the late John Francis Williams (1949 – 2005), whose harmless lump turned out to be a malignant fibrous histiosarcoma. @Jen, my recollection (from incorrectly driving in there one day years ago and paying for parking, when actually I needed the pathology place across the street) is it used to be about $8 for parking, flat fee. I noticed the other day they’ve moved to time-based charges which add up to a lot more in most cases. But I took the bus! @Vaughan, in case I wasn’t clear enough, it will be coming out and being biopsied.